A Personalised embroidered kids apron in your choice of size and colour. 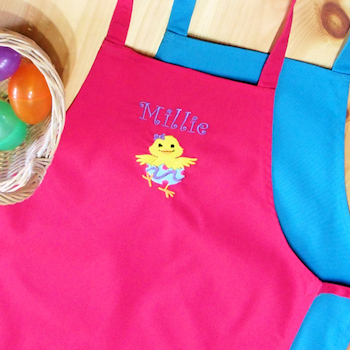 Personalised with an embroidered name and adorable Easter Chick motif. This childs apron is perfect for kids who love to bake and best of all it helps protects childrens clothing while they help learn to cook. This childs apron is perfect for kids who love to bake and best of all it helps protects childrens clothing while they help learn to cook. Useful apron for baking, cleaning or arts and crafts and is made from 65% Polyester and 35% Cotton mix. Please choose the colour of apron you would like and a thread colour for the name.